March, 2008 - As I swam, the rainbow that's ubiquitous on St. Barts quickened over St. Jean Bay. Finally its magenta echoed that of the bougainvillea in white urns facing the villa pool, and the bow's aqua mirrored that of the pool itself. By 9 a.m. croissant and French bread delivered earlier to our door had been washed down alfresco with a hot pot of coffee in this scrupulously appointed four-bedroom marvel known as Villa Jardin (WV VGM) in the world of WIMCO. Racing poolside through Three Cups of Tea (about one man's epiphany after stumbling on some of the world's neediest), I marked the page about success being measured not necessarily by gross national product but by gross national happiness. 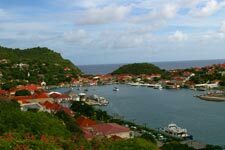 By the definition, everyone living on St. Barts appears to manifest a highest level happiness quotient. The salubrious effect of this happiness, like that of the reoccurring rainbow, spilled over into Villa Jardin. In fact, a spate of laughter among us prompted our French-speaking host to suggest that we "had swallowed a clown," as they say. 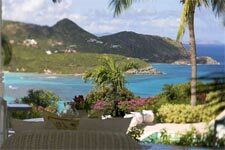 However, as with refined presentation, any bumps (except for the roads) and blemishes or untoward attitude toward its guests don't surface on St. Barts where the island's raison d'etre is serving each other and vacationing guests, all of whom expect to sip, shop, sun, swim and sleep in superlative style. 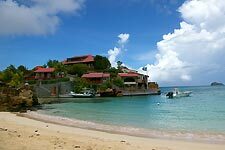 It's entirely possible that Americans flock here to enjoy the space and privacy of its villas and to mingle among celebrities in such accommodations as Hotel Carl Gustaf, replete with chanteuse, and consume more French champagne than elsewhere in the Caribbean. Shops like Kristina Popovitch show the latest in French-inspired "must-haves" such as an ankle-length, cedar-green silk skirt that would look great with boots and a black sweater, except for the Euro-dollar challenge. At Mia Tia the linens are fine and quirky and used to swath guests at three (that we know of) island vacation villas available through WIMCO. Cuban cigars, foie gras and scents from M' Bolo to transform Stateside rooms to sensual abodes are just a few (who's bothering to count!) of the island's temptations. If you're a guy, there are additional temptations, such the models a la Stanley Kubrik at Le Ti St. Barth who sport T-shirts and tulle among other fashion trends, as diners digest what the restaurant claims is the best beef on the island. Even the DJ here is subtle, the beat not too loud, not too strident. Beyond the hotels with some 200 guest rooms and the villas with an estimated 1,200 guest rooms, all delivering variations on the promises of walk-to-beach and spectacular views, St. Barts has a quiet side of vegetation-covered hills, a handful of goats and a few stray dogs. Most shops close on Sundays so that indigenous folks can enjoy their beaches. On any given day you're apt to run into last night's bartender taking a break from windsurfing with friends at La Plage. Out of respect for the burnout factor that comes with any customer service business, the island is essentially closed in September, a month that can also mean hurricanes. For those considering an escape to St. Barts, keep in mind that accommodations-wise hotel and villa rates are highest around Christmas; low season is from mid-April to mid-December. (For example, the weekly rate for Villa Jardin is almost 50 percent less in the spring, summer and fall.) Because St. Barts is so popular with celebs et al, some of its 60 restaurants book out a year in advance for peak times, so do plan ahead. It's always possible, of course, by prior arrangement, to dine al fresco at your own vacation villa, with arrangements made by David Cocktail, one of several local catering companies that will also provision your villa to your specifications in advance of your arrival.